Saddle up for some retro dungeon-crawling goodness with the latest entry in the Cladun series, Cladun Returns: This is Sengoku! The Classic Dungeon series is back! 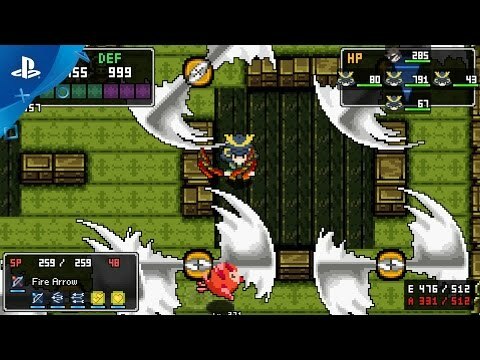 And they're doubling-down on "Classic" with their latest entry, Cladun Returns: This is Sengoku! Set in the Japan's Sengoku Era, you arrive in the mysterious land of Arcanus Cella. Here, you and your 8-bit allies will hack, slash, and bash your way through trap-filled, monster-infested dungeons set in actual locations from feudal Japan. In doing so, you will assist the souls of the dead with settling their unfinished business so that they may begin the process of reincarnation. You'll also get money, loot, and artifacts to make yourself strong enough to take on even harder challenges! Featuring robust character customization, you can design your character's appearance and equipment right down to the individual pixel! And you can share your creations with your friends, too! Try teaming up with your friends in Co-op Mode to take on the most challenging dungeons, or challenge your friends in Versus Mode to collect the most points! You can also test speed-run skills by clearing dungeons as fast as possible to secure a top spot in the online leaderboards! You wake up in the mysterious land of Arcanus Cella, where the souls of the dead gather as they await reincarnation. However, some souls have unfinished business that needs to be settled before they can reincarnate. As the player, you will assist these souls by traveling to real-world locations in feudal Japan and fighting your way through dangerous dungeons filled with monsters and traps.